Before Boersma’s articulation of [The T-model], many had considered the practice of information architecture as the overarching umbrella, referring to this as Big IA. In 2004, UX design professional Peter Boersma suggested that information architecture was one of the many disciplines that come together to shape the multidisciplinary practice of user experience design for the Web. He titled the diagram he used to express this concept The T-model, shown in Figure 1. Before Boersma’s articulation of this viewpoint, many information architects had considered the practice of information architecture as the overarching umbrella, referring to this as Big IA. Since Boersma created his diagram, many respected practitioners of information architecture have adopted a similar position. In his 2008 IA Summit plenary, Andrew Hinton described the practice of information architecture as one of a tribe of many disciplines that contribute to the broader practice of user experience design. And in their latest book, Pervasive Information Architecture: Designing Cross-Channel Experiences,  Andrea Resmini and Luca Rosati have concurred with Boersma—referring to the practice of information architecture as a necessary part of the user experience design elephant. To help you navigate the practice of information architecture—and set the context for my future columns—I’d like to confirm that it’s important to view the practice of information architecture—and its relationship to the practice of user experience design—through the lens of the Boersma T-model. I’d like to make the information architecture vertical less abstract by filling it in with the six primary areas of interest that encapsulate the practice of information architecture…. Now that we have the Boersma T-model as a reference, I’d like to make the information architecture vertical less abstract by filling it in, in Figure 2, with the six primary areas of interest that encapsulate the practice of information architecture that I explored in my last column, Framing the Practice of Information Architecture. Using the Boersma T-model, let’s explore how to set the criteria for a qualified practitioner of information architecture and why we need better communication of these criteria to help both junior and senior professionals become more qualified candidates. Using the Boersma T-model, let’s explore how to set the criteria for a qualified practitioner of information architecture…. An important aspect of any information architecture practice is cultivating the competencies of existing staff. I’m currently researching theoretical approaches to this topic through the DSIA Research Initiative and, thus, have had an opportunity to test my insights in practice. However, while I have confidence in my methods of cultivating the talents of my existing staff, I’m not as confident about the grooming and preparation of freshman and junior practitioners, which takes place externally to my organization. Colleges, professional training organizations, and workshops are vital to the ecosystem that produces qualified entry-level and junior professionals. However, we no longer live in a time when jobs are just waiting for recent graduates to fill them. I recently had lunch with a fellow practitioner who reminded me of this reality. I couldn’t help but recall others’ needing the same opportunity to gain experience, in the mid-to-late ’90s, but with one major difference. At that time, there was a feast of available opportunities for someone entering the IA profession to exercise their skills to the point where they could become proficient and build a sufficient resume and portfolio rather quickly. Everyone was hiring! It was a gold rush, of sorts, with plenty of room for everyone. Jobs and opportunities flowed like the Mississippi after five days of non-stop rain. Businesses that were looking to get on the Internet were everywhere. Producing design solutions that are accountable for meeting real business objectives and actually work is the demand that UX professionals must now meet. which spanned the ridiculous to the revolutionary. Today, every business understands that they must use the Web to support their business model. From the many bright minds in the field of UX design, businesses are also learning that their Web strategies must be meaningful and/or sustainable. Thus, there is an increasing demand for UX design professionals who understand how to get to the meaningful and sustainable. The industry of user experience has stabilized for the most part. Now, the field of user experience is dense with UX design professionals—though it is not saturated to the point where there are few opportunities. However, it is at a state where opportunities are harder to come by, because of the growing complexity of creating digital products and services that work. Producing design solutions that are accountable for meeting real business objectives and actually work is the demand that UX professionals must now meet. As a result, a three- to five-year gap between formal training and professional readiness can be a grueling road for some eager, new practitioners of information architecture. I am concerned that the desire of many in the field—including myself—to hire senior IA practitioners, without giving new and junior practitioners any path to attaining senior-level skills, may slow our field’s ability to respond to future demand. What I also find disturbing is the lack of competency that some senior IA practitioners, with three to five years of experience, demonstrate when looking for employment. 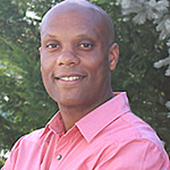 As a manager of an IA team, I have reviewed many resumes and portfolios of IA practitioners who don’t meet the basic requirements; whose design artifacts don’t reflect what I would expect of someone with senior-level experience. Does anyone know what junior or senior means? UX design managers, managers of information architecture, and IA practitioners should have a shared understanding of what makes a junior or senior IA practitioner a viable candidate. As a manager of information architecture, I am first and foremost looking for someone with previous success in the broader practice of user experience design. Practicing information architecture isn’t just about information architecture. It’s about creating design solutions that do more than solve problems relating to information organization, navigation, and associative relationships. In fact, a major part of becoming proficient at implementing a successful information architecture is having adequate experience in the practice of UX design. Consequently, as a manager of information architecture, I am first and foremost looking for someone with previous success in the broader practice of user experience design. Highly qualified junior UX professionals have knowledge of and have had exposure to most, if not all, of the required skills with which senior UX professionals are familiar, but with many fewer hours under their belt. Unlike senior UX professionals, junior UX professionals might lack a core competency—meaning, they have not developed deep knowledge and skills in any particular discipline among all of the disciplines in which UX professionals have skills. For example, referring to the T-model, a deep proficiency would mean fluency in the four lower tiers in the practice vertical of information architecture. 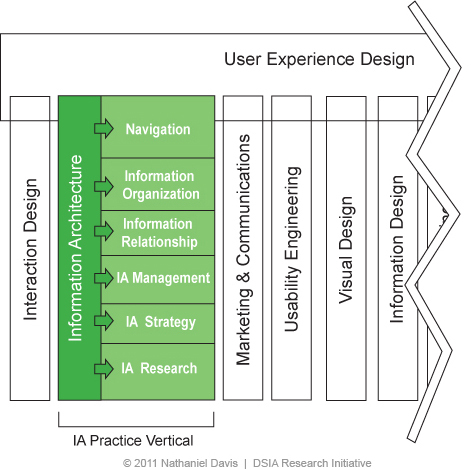 So, if I’m looking to build out my IA practice within the UX design organization, I should start scouting for an IA practitioner who has knowledge and aptitude in those lower tiers, shown in Figure 3. 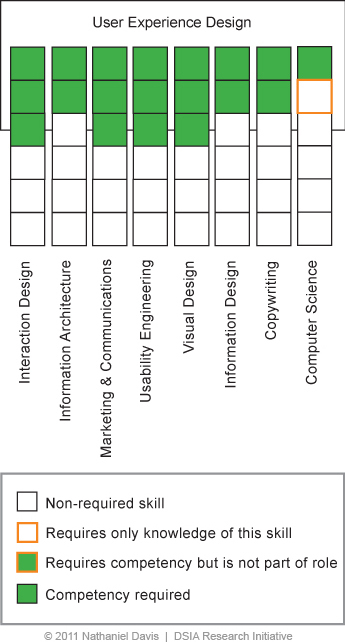 Regarding a candidate’s competency in the IA practice vertical, Figure 3 suggests that a junior or senior practitioner with a stated core competency in information architecture should be able to provide supporting artifacts and have general knowledge and experience of each tier that accords with their level of experience. 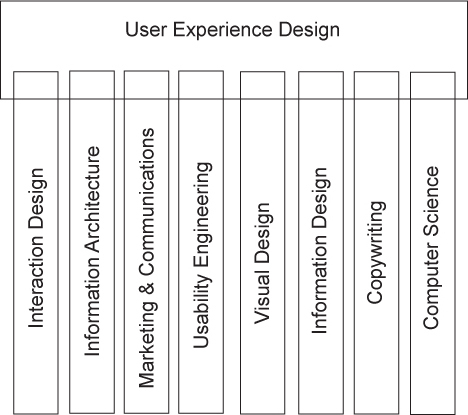 But, what about the skills from the other UX design practice verticals to which an IA practitioner must have exposure? What might the T of a UX design professional, with a core competency in information architecture look like? 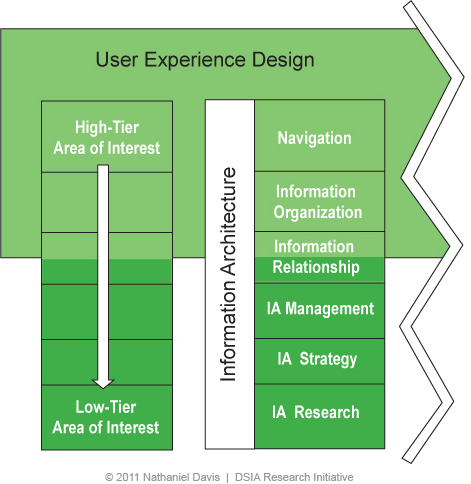 If you’re either a hiring manager who is not sure exactly what additional high- and low-tier skills to look for or an IA practitioner who is unclear about the UX design skills you need as complements to your IA competencies, you can refer to the Boersma T-model—at least as a high-level reference. It’s important to note that Boersma’s T-model could be organized differently, and it is missing a few practice verticals that are more prevalent today. For example, UX strategy, content strategy, and business analysis aren’t part of his T-model. If we introduced content strategy to this model, we would most likely group copywriting and content strategy in one vertical. But Boersma’s original list still provides a good foundation. So what’s the point? Similar to the way I’ve demonstrated the idea of high- and low-tier skills in information architecture, it would be possible to go through the same exercise for the other practice verticals. However, plotting out the high and low tiers for each practice vertical here would make this column unbearably long! But it’s definitely a useful exercise that I’ll explore in a follow-up column. For now, let’s pretend we’ve actually done an inventory of each practice vertical. What would it tell us about the high-tier skills of each practice vertical in which junior and senior practitioners must be competent? And what might the T of a UX design professional, with a core competency in information architecture look like? Figures 4 and 5 provide two info graphics that give a rough idea. If we could define a set of high and low tiers of skills for each practice vertical in the Boersma T-model, we would have a better way of identifying the expected core competencies of both junior and senior UX professionals in all disciplines within user experience. The greater value of the T-model-based info graphics in Figures 4 and 5 is in our knowing what is in each tier for each practice vertical. As a start, I’ve already plotted the practice of information architecture. 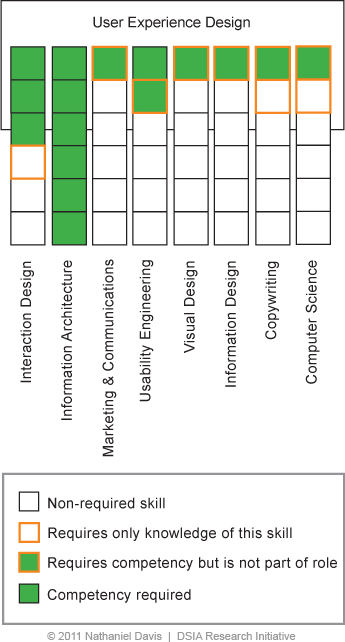 In light of the tiers I’ve defined for the IA practice vertical, even the limited data those figures show may assist you in determining whether you need a broadly skilled UX designer or an information architect. If we could define a set of high and low tiers of skills for each practice vertical in the Boersma T-model, we would have a better way of identifying the expected core competencies of both junior and senior UX professionals in all disciplines within user experience. With clear definitions of these practice verticals in place, UX managers could better plot a UX professional’s core competency, and UX professionals would have a useful tool for performing their own self-assessment of their readiness for professional advancement. It would be a win-win for everyone. If you’re a manager of an information architecture or UX design group, you can use the T-model to express the high and low tiers of skills for the practice verticals in your organization. This could help you isolate skill sets in a way that enables you to be more strategic about the hiring of information architects. Practitioners, take note. In Part 2 of this series, I’ll propose the high and low tiers for each practice vertical of the Boersma T-model. Take a stab at this yourself, and we’ll see if we all agree. Once we’ve accomplished that, we should have a more detailed T-model that hiring managers can use to better clarify their expectations of IA practitioners and other UX design professionals. Resmini, Andrea, and Luca Rosati. Pervasive information Architecture: Designing Cross-Channel Experiences. Burlington, MA: Morgan Kaufmann Publishers, 2011.